‘Beyond belief is the love-life of women, the destiny of men.’ (A Sanskrit proverb. Striyas charitram—purushyassya bhaggyam). WHO was the most famous — or, at any rate, the most talked- about woman of the 1990s? Princess Diana? — Mother Teresa? What about Monica Lewinsky , who nearly busted President Bill Clinton, and then made a fortune by writing her memoirs ? She who was portrayed by the New Yorker Magazine as a new avatar of Mona Lisa — the world’s most famous portrait. Remember? what a scandal! But it all ended fairly tamely. Bill Clinton was able to remain in office for his full term and soon bounced back into full form as a brilliantly successful U.S president who still retains enough charisma to upstage other contenders for the limelight, wherever he chooses to put in an appearances — as for instance at this year’s Wimbledon: causing a buzz among the spectators as heads turn and fingers point ...while Monica is no more than a footnote to history. She has caused no lasting damage. Not so the ‘other’ Monica, Goghlan, who lives in London and who, as they say, worked a ‘patch’ in Mayfair, meaning that she made a living as a prostitute. She became instrumental in causing the ruin of one of the most colourful political figures in Britain who, as it happened, was also a self-made multimillionaire. Unbelievably, all those millions were earned in a calling that is proverbially unrewarding, writing. Surely, you have guessed the name, for there can be no other person on the planet who had done it before: Combined a political career with that of a novelist and made a glittering success of both careers? Yes, Jeffrey Archer. One of the world’s highest-selling novelists who was also the Deputy Chairman of the Conservative Party in Britain and who made no secret of his ambition that he wanted to be his country’s Prime Minister . The story of his life stands as proof that truth is often stranger than fiction, as also of that Sanskrit saying: Beyond belief is the destiny of men. Brought up as a child by a doting single-parent mother, Jeffrey’s early schooling was sketchy: but, such as it was, it helped to make him streetsmart. Not particularly good at studies, he sought to make his mark by excelling in athletics. He is said to have wormed his way into Oxford without possessing the requisite qualifications, but once in , soon made his mark by his zest for raising money for charities. He developed a positive talent for fund-raising by getting big-name politicians and public figures to make personal appearances for charitable causes, which incidentally also enabled Archer, still a student, to share platforms with such famous people as Britain’s Prime Minister, the Beatles, and Jackie Kennedy. He raised record sums, and fund-raising became his speciality. He decided to make a career of it, becoming a sort of ‘managing agent’ for public charities on a ten per cent commission. The business prospered. He got married, to an implausibly beautiful, highly-talented, Oxford student, Mary Weeder, and set up house. He lived well, even flamboyantly, assiduously building up a political base, and proved his merit by standing for parliament in a ‘difficult’ constituency and won handsomely. 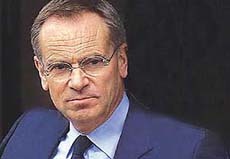 Barely 30, Jeffrey Archer was well and truly launched on the career he had planned for himself: To became Britain’s Prime Minister, and to make a lot of money. What could stop him? Nothing except that there are in Britain, newspapers which they call "The Tabloids" which, while they thrive on scandal, seem to demand from their political leaders a puratinical code of conduct. The self-appointed watchdogs make sure that those in the public eye behave themselves like saints. No padded vouchers for incidental expenses, no false claims for lunches for which someone else has paid the bill — and someone taking a ten per cent cut while collecting funds on behalf of charitable organisations was, well, a man to be kept under watch. The strictness with which this code is applied by the Tabloids was brought out when they raised a stink over a British Cabinet Minister of an earlier Tory regime, Norman Lamont, buying a bottle of champagne by using a credit card which, alas did not have enough money to pay for the purchase. For the Tabloids, it was headline news. But aren’t credit card over drawals confidential? — well, nothing is confidential for the Tabloids. Also, Isn’t a powerful minister not having enough money in his pocket to pay for a bottle of wine a factor in his favour? That to be that cash- strapped, he must be making do on his salary, and took no bribes? Not in Britain, where the Tabloids sought to give their own spin to the purchase. Why was Lamont buying wine in a store that he did not normally frequent? Was he entertaining someone to dinner? Who ? The insinuation being that it must be a woman who could not, of course, be Mrs Lamont. That, for politicians in Britain, is the ultimate sin. For the newspapers, it is the gods beaming banner headlines extra editions as the scandal unfolds. The circulation zooms. And poor Jeffrey Archer was caught doing just that: visiting a prostitute: Monica Coghlan who kept a room in the Albion Hotel near Victoria station. On an August night in 1987, Aziz Kurtha, an Indian who had settled down in London and had spent some time with Monica in her hotel room, had offered to drive her back to her ‘patch’ in Mayfair. But even as they were getting into Kurtha’s car, they saw that another car which had just driven up was obviously making signals to Monica by its driver flashing its lights on and off. Aziz Kurtha recognised both the car and the driver, and said something to Monica about her winning the jackpot. "What do you mean ?" Monica asked, and Kurtha said: "Don’t you know this is the Deputy Chairman of the Tory party and famous novelist, Jeffrey Archer?" It would seem that Monica really didn’t. But now she did. Kurtha was later to testify in court that, as he sat in his car, Monica got out, walked over to the other car to talk to its driver, a man, whom she later led back into the hotel. Aziz Kurtha could hardly wait to sell his story to the papers not to make money for himself, but for one of his pet charities in Pakistan. We last saw Jeffrey Archer as a newly-minted MP, and still under 30 remember? Now, when his career is about to go off in flames, he is 47. The missing 17 years have seen such fantastic ups and downs in his fortunes as to defy belief. They range from disgrace and poverty to an incredible reversal to wealth and fame, all leading up to the final climax brought about by his visit to a prostitute. If only to appreciate the full scale of the tragedy, it is worth going back in time and taking up the story of Jeffrey Archer where we left it.